Seeing that Adams had a pair of queens, the Master took his last card face down as his groupies on the rail crowded around to see him peel up the corner. A queen would give Nguyen a straight, or a king would give him a better pair than Adams’ queens. “King!” The announcement came as the crowd exploded into celebration. The K was turned over and Men Nguyen earned his 7th bracelet and $394,800 in prize money. Adams capped an impressive day going from among the low stacks at the start of the day to runner up of the event, taking $243,958 for his work. The pot to Nguyen to 2.5 million chipos, while Evdakov exited in 4th place. Nguyen hit three 7’s, besting the two pair held by Billirakis, sending him to the rail in 3rd place. Left heads up were Brandon Adams and Men Nguyen. Adams’ two pair was good and Nguyen mucked. Nguyen still had the chip lead after the hand, with 2.1 million in chips, but Adams was climbing into contention with 925,000. A pair of nines was good enough for Evdakov to send Cassidy to the rail in 5th place. Mizrachi finished one better than his runner up in the Players Championship, Vladimir Schmelev, who went out in 7th place. A 6th place finish in this event after winning the Players Championship catapults Mizrachi to the top of the WSOP Player of the Year rankings. Schmelev is hanging tough at this final table, following a 2nd place finish in the $50,000 Players Championship. The Grinder’s two pair took the pot and he took a sizable pot to increase his stack to around 600,000. Men Nguyen raised and Vladimir Schmelev re-raised and the two were heads up. Schmelev bet on 4th street and Nguyen called. On 5th street Schmelev check-raised the Master and Nguyen called. Schmelev bet the last two streets and Nguyen raised on the end. Schmelev called and they showed down. Nguyen took the pot and jumped to 1,150,000 in chips. Schmelev dropped to 115,000 and eliminated soon after. In a 5-way pot, Men Nguyen led out on 4th street, Steve Billirakis folded and Vladimir Schmelev re=raised. Nikolay Evdakov and Brandon Adams folded and Nguyen re-raised Schmelev all in. Nguyen’s two pair took the pot and sent Schmelev to the rail in 7th place. The pot took Billirakis to 550,000. Mizrachi dropped to 400,000. After Brandon Adams completed, Men Nguyen raised, Vladimir Schmelev re-raised and Joe Cassidy raised yet again. Everyone got out of the way except Schmelev. After losing the pot without showing down, Schmelev was on life support with 90,000 in chips. Cassidy boosted to 480,000. With the win he had around 115,000 in chips, but around 15 minutes later he was eliminated. Heimiller was out in 9th Place, and the final 8 were moved to the feature table. Evdakov’s straight took it down, pushing his stack to around one million and dropping Jamshidi to 220,000 in the process. Two pair earned Adams the pot, pushing his stack to 800,000. Jamshidi’s already short stack dwindled to around 140,000. Adams was among the chip leaders following the hand. After dropping some chips in the previous level, Men Nguyen was able to capitalize on a full house to take a nice pot from Sirous Jamshidi. Jamshidi completed on 3rd street and was called by Michael Mizrachi, Nguyen, and Steve Billirakis. Jamshidi bet and Nguyen raised on 4th street, leading to folds from Mizrachi and Billirakis. Nguyen had 360,000 after the hand, and Jamshidi fell to 180,000. Mizrachi took the pot and chipped back up to nearly 500,000, while Cassidy dropped to 300,000. The Grinder lost a previous hand to the Master, but this hand put his chip stack back around 450,000. A short-stacked Eric Buchman completed on third street and was called by the chip leader, Vladimir Schmelev. Buchman led out on 4th street and bet again, getting called. Schmelev connected for a pair of eights on 5th street and put Buchman all in. Buchman called and didn’t improve his buried pair of 4s, busting in 12th place. Shortly after, Schmelev was the first to surpass one million in chips. Looks like he’s ready for another final table at the 2010 WSOP. Brandon Adams entered the day short on chips, but has since chipped up and in the process knocked out Ray Dehkharghani. Adams’ trip Jacks took a nice pot and was no longer among the short stacks, holding 400,000 in chips. 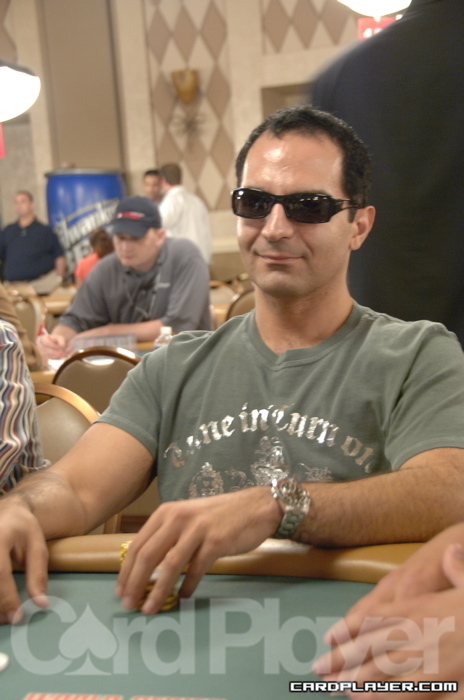 Shortly after Dehkharghani got all in, again against Adams, and Adams hit a flush to send Dehkharghani out in 11th place. With Barlow’s elimination, the final 10 are set. The cards are in the air. Only 12 players remain, including event No. 2 winner Michael Mizrachi, runner up in that event Vladimir Schmelev, as well as a host of other big names including Steve Billirakis, Joe Cassidy, Men Nguyen, and Brandon Adams. Stay tuned to CardPlayer.com for live updates through the day.